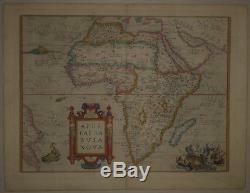 Genuine antique map "Africae Tabula Nova" by Abraham Ortelius. True First State of this important map. Published in the Theatrum Orbis Terrarum in 1570, replacing Sebastian Munster's widely circulated map of 1540, and closely following Gastaldi's wall map. This remained the standard map of Africa well into the 17th century. Two important changes to the shape of the continent were introduced: the Cape of Good Hope became more pointed, and the eastward extension of the continent was significantly reduced. Sea monsters inhabit the oceans and ships move with billowing sails. Beautiful hand color on heavy paper. Wear at centerfold, just affecting image at bottom. Highly desirable map, here in the scarce first state. Measures 14 1/2" x 19 3/4". All of our items are genuine antiques as described. The item "1570 Genuine Antique hand colored map of Africa. Ortelius" is in sale since Tuesday, January 23, 2018. This item is in the category "Antiques\Maps, Atlases & Globes\Map & Globe Mixed Lots". The seller is "antiqueatlas" and is located in Troy, Montana. This item can be shipped worldwide.